Guess what day it is Throw Back Thursday!!! Myself and all of my One Stamp At A Time Blog Hoppin friends are throwing it back today! Did you get to me by way of the amazing Justin Krieger?? His style never ceases to amaze me. So this months hop is a "Throw Back Thursday" hop. Each of us had to choose a card from our past and bring it back using new or current products. There could be a few of us who chose to bust in to our vault of retired stuff but you will have to tour the whole hop to see! My throwback is going back to March of 2016. I actually made the card below for this very hop! The theme was Spring Has Sprung and whipped up this beautiful Double Gate Fold card using our retired set Choose Happiness and a bit of the Sale-A-Bration DSP. I have linked the picture so if you want to take a peak at that hop as well just click the picture below! Did I take too many pictures? I wanted to be sure I showed you all every detail. 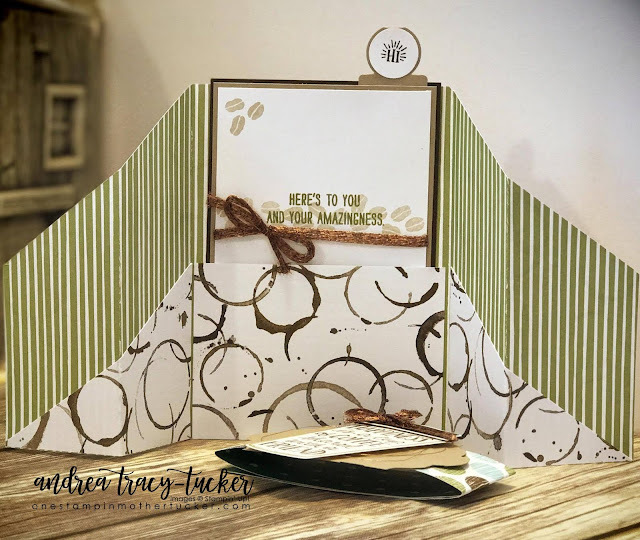 This Double Gate Fold card was made using the Coffee Break DSP, Early Espresso Card Stock and Crumb Cake Card Stock. 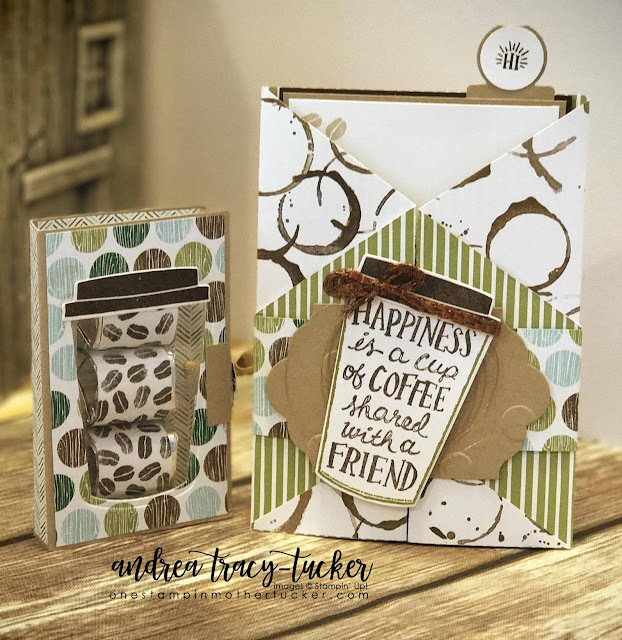 The Coffee Cafe Bundle has an amazingly cute sentiment that fit right in the cup and was perfect in Early Espresso ink as well as the lid. I chose to use the cup stamp from the Merry Cafe in Old Olive ink. I put a cute little Copper Trim bow at the top before adhering the Copper Metallic Thread loops to the Polka Dot Basics embossed Lots of Label made using Crumb Cake Card Stock. You will notice this is on a nice little belly band to hold the card closed. When opened my Circle Tab Punch was perfect addition to the top so that you can pull the card right out of the pocket. You could even put a gift card or gift certificate in this pocket if you wanted to. 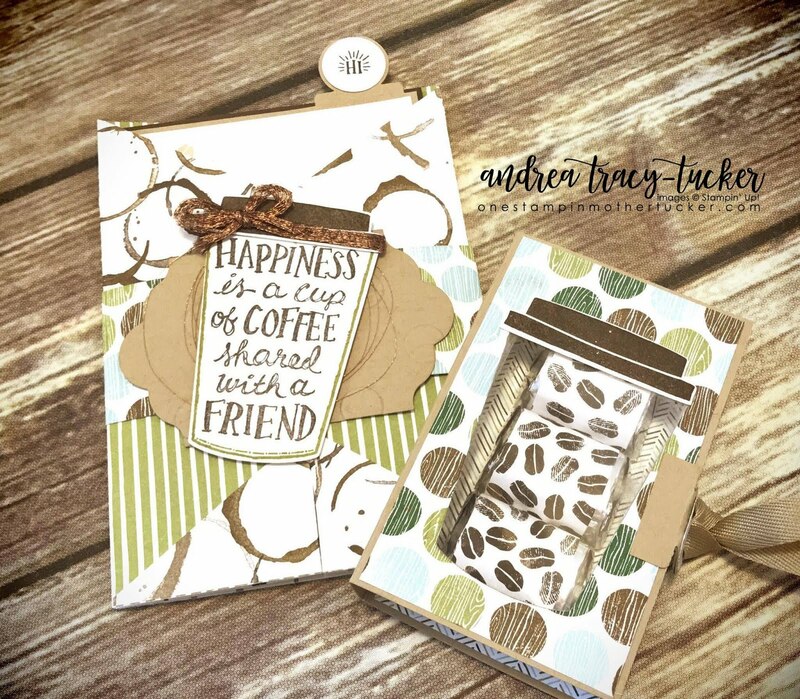 The Old Olive sentiment on the inside is from the set Mixed Drinks but somehow seemed appropriate with the Sahara Sand Coffee Beans. The cute little treat holder I will be sure to get a tutorial up of over the weekend. I simply adhered DSP to this cute little Hershey Nugget Holder before die cutting the coffee cup window out. I added an acetate window just for added protection. I used three Hershey Nuggets and wrapped them with more of the Coffee Break DSP and adhered them behind my coffee cup shaped window. Adorable right?? Thank you so much for stopping by! I can't wait for you to see what Elizabeth has come up with for you! You can get to her by clicking the next button below or if you get lost there is a full list of all of our hoppers! You knocked it out of the park as usual. Gorgeous coffee (my favorite) theme! Super cute projects. Almost makes me wish I liked coffee. I look forward to your tutorial. 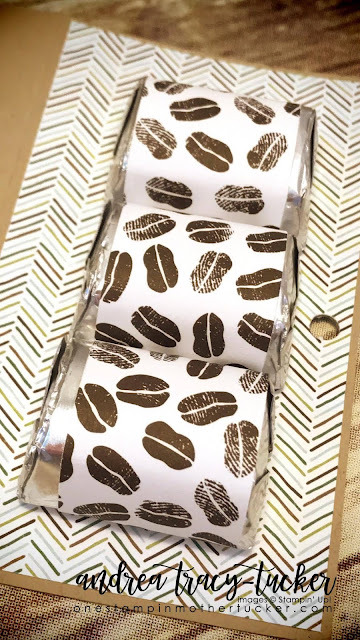 These are great ideas for coffee drinkers!!! TY for showing these. I think I will explore around your blog some more!!! Not too many pictures-I love seeing all of the details! Awesome job Andrea!